This week I've been looking at various ways of comparing the newspaper printed front page with their online equivalents. Yesterday I looked closely at the Daily Mail and the Mail Online, and today I want to look at The Times. 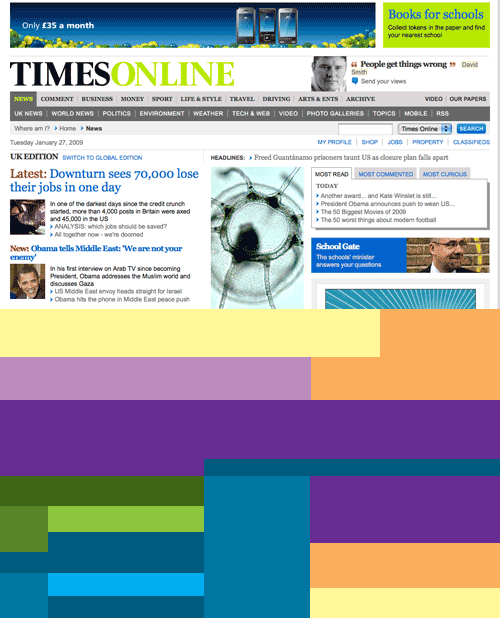 We can see a big contrast here between The Times print and web incarnations. 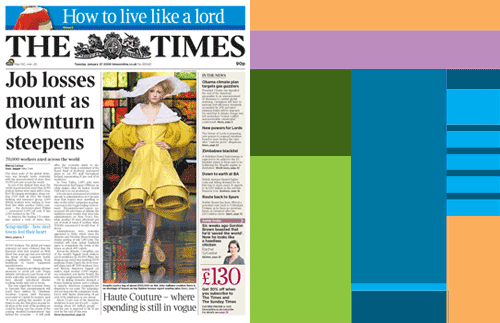 72% of the surface area of the printed front page is given over to carrying stories. By contrast, only a quarter of the online screen real estate carries news. The vast bulk of the online homepage is made up of navigation (30%), third-party advertising (16%) and promotions for content elsewhere on the site (15%). Tomorrow I'll be carrying out the same exercise for a 'red top' tabloid - The Sun.